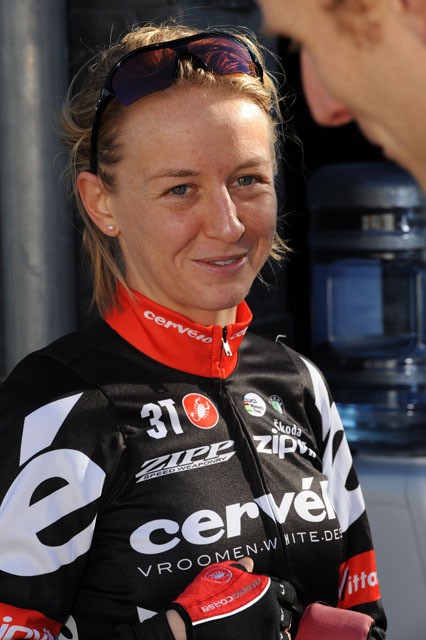 It has been a superb first season with the Cervélo team for Emma Pooley. She ended the year ranked the ninth best rider in the world and fifth in the World Cup overall standings. A strong contender for the most impressive ride of the season has to be Pooley’s victory in the Montreal World Cup, when she attacked right at the start and held on to win by more than a minute. 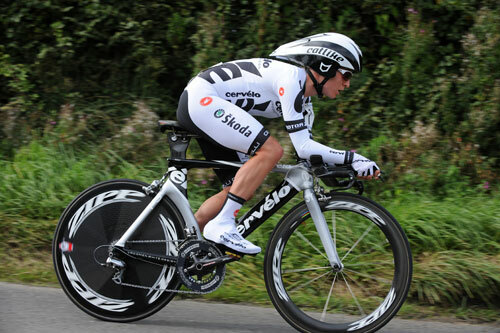 On tough, hilly courses she combines her climbing ability with time trialling power to brilliant effect, as she did again at the Grand Prix Plouay to clinch her second World Cup win of the season. In 50 kilometres she opened and maintained a gap of two-and-a-half minutes over the bunch. She followed in the footsteps of Nicole Cooke, the 2007 winner, by taking the overall honours in the Grande Boucle stage race in France. Her lack of a sprint finish means that she needs difficult, selective courses in order to get rid off as many of her rivals as possible. Had the National Championship road race in Abergavenny tackled the climb of The Tumble, as the men did, she may have had a chance to attack Cooke. As it was, the odds were stacked against her in the sprint. Three days in the pink jersey and fourth place overall at the Giro d’Italia, at 10 days arguably the hardest women’s stage race in the world, confirmed her climbing ability. With Cooke off form, Pooley approached the World Championships as Britain’s best hope of a medal. She went into the week in Mendrisio off the back of a solid eighth place overall in the Tour de l’Ardeche. However, things did not go according to plan. Pooley admitted to being disappointed with her 11th place in the time trial, which was a surprising result. She was a constant factor in the road race, but perhaps didn’t ride as wisely as she needed to and did too much to soon in a bid to stretch the field. In the end, when Tatiana Guderzo of Italy attacked and three riders went with her on the final lap, Pooley was unable to respond. Her disappointment at the finish probably masked the positive aspects of her race and certainly did not detract from a season when she established herself in the very highest echelons of the women’s peloton. Pooley attacked after 400 metres of the 110-kilometre race, held on a hilly circuit in the Canadian city. The peloton made the mistake of letting her go and at the finish line she still had a gap of one minute and 14 seconds over the bunch. It was an emphatic and extraordinary win. Laying down the gauntlet in the French stage race, Pooley win the 18-kilometre opening time trial by 24 seconds from Marianne Vos, the Dutch sensation. Winning the third stage, which hit the Pyrenees set Pooley up for overall victory, which she confirmed the following day with a tactically strong ride in the mountains. After breaking away with Mara Abbott on the third stage of the race to Monte Serra, Pooley was edged out in the sprint but took the leader’s pink jersey. She held the lead for three days but eventually finished fourth overall. Beating Wendy Houvenaghel by 30 seconds on the course at Botolph Claydon in Buckinghamshire gave Pooley her first national title.